In an itinerary that feels like a movie adventure, students will journey to the grasslands and sand dunes of inner Mongolia for a taste of China that is sure to be something different. The trip kicks off with a visit to Buddhist monasteries followed by an authentic Mongolian feast. Adventures continue with students rotating in groups between learning Mongolian wrestling, horseback riding, archery, and how to prepare authentic Mongolian food. The itinerary continues to cover living and learning alongside local tribespeople about their nomadic lifestyles. Students will also see monuments raised to Genghis Khan, go sandboarding, ride ATVs, and go camel trekking. One of our most exciting itineraries! Arrive and transfer into the city. Pay a visit to Dazhao Temple, the oldest building and largest temple in Hohhot. After the Silver Buddha statue was dedicated to the temple by the third Tibetan Dalai Lama in 1586, Hohhot became a religious centre for people all over Mongolia who came to worship. The design of the temple is unique as it blends traditionally Mongolian elements with Buddhist symbolism. (Ask our specialists about our Dazhao temple worksheet). Spend time at the local artisan street in the area and enjoy browsing the handicrafts, tchotchkes, skins, and furs that are traditionally sold in this area of the city. Next, we drive over the mountains that demarcate the beginning of the grasslands. We finish the day with an authentic Mongolian feast and some traditional welcoming ceremonies. We breakfast the local way, with milk tea and a simple meal of traditional porridge and vegetables (cereal available upon request). Students are then taken on a short walking tour of the grasslands. We teach students about how to differentiate between the different grasses and plants found on the grasslands and, after stopping for some photos, we take a short pony or pony carriage tour (dependent on season) to a local Oboo (Mongolian holy place and gathering spot). In the afternoon, we fly kites under the blue skies on the open grasslands. The day finishes with a campfire and storytelling session. 28% of China is covered in desert and today is a chance for students to experience it. On the way there we pass the ghost town of Ordos (optional: walk around for photos in the ghost town), a great opportunity to teach students about housing bubbles and what kind of economic circumstances lead to such a situation. Upon arrival, we enter the desert site at which we will spend the afternoon. After a safety briefing, students will have the freedom to choose between various activities such as sand sledging, ATV rides, camel rides, zip lines etc… (Optional: participate in a workshop about desertification in China and the steps being taken to combat and reclaim arid land). Today, students travel back in time as we visit the Genghis Khan memorial (the real tomb of Genghis Khan himself is yet to be discovered) where original shrines, weapons, jewellery and clothing from the reign of Genghis Khan are preserved. We get a chance to look at the actual bow and saddle of the world’s greatest conqueror and discuss how his political legacy – and descendants – directly influenced the development of China. Discuss how the Yuan dynasty contributed to China’s current religious and trade landscapes. After a morning of history, we transfer back to Hohhot. Finally, we have dinner at an evening show which showcases facets of Mongolian culture. We start the morning with a visit to the Yili milk products factory, one of Inner Mongolia’s largest industries. Take a look at how milk is processed, packaged and distributed to the nation. Next, we visit the Inner Mongolia Museum which, in addition to fascinating cultural artefacts, has a significant dinosaur exhibition as Inner Mongolia has been the excavation site for numerous fossil zones and nests. Finally, before we transfer to the airport, we stop at the Islamic district in Hohhot inhabited by the Hui Muslims who migrated in force to this region in the Qing Dynasty. Turkic and Central Asian styles can be found on the architecture here, including in and around the Grand Mosque. Action; students will push themselves physically through the wealth of activities planned throughout the week. Horseback riding, dune sliding, and sandboarding etc… will be sure to give students a sense of pride in their physical accomplishments! Ethnic/Cultural Diversity; though still within China, students will be quick to notice that these people live completely different lifestyles, with different cultural practices. 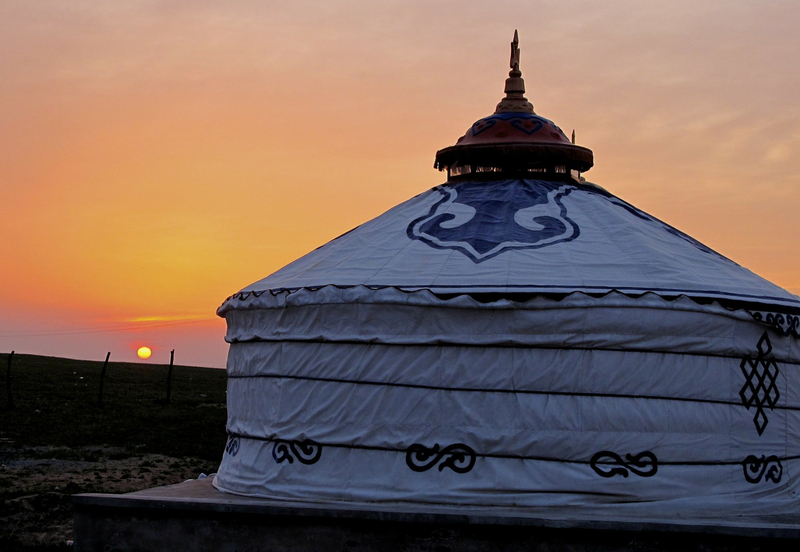 Students will be immersing themselves in the best of Mongolian culture throughout the itinerary, experiencing their culinary, sports, spiritual, historical, and nomadic culture. Service & Sustainability; Learning the lifestyle of the local nomadic tribespeople, students will be able to experience first-hand just how co-dependent these people’s lives are to the patterns of nature. Students should compare their experiences on the trip to those of their daily lives back home for an understanding of how environmental change and consumption affects real people’s livelihoods.